Interesting. 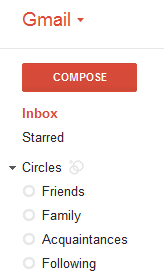 I'm an Apps user and my GMail is showing Circles but my Contacts is still the old interface. One thing I haven't figured out is how to use Circles in the search box, so I could see the unread messages from a circle or something like that. One more thing expected is to see the uread content of the circles. Indeed this is so half-assed. I can see the unread count for my circles but can't actually see any unread emails. If Google is wondering why G+ etc is not taking off like Facebook they only need to look at this. It's typical of their overall half-assed approach to everything except search and maps imho. i have to agree with Dave Sag. i love and admire the Do No Evil mantra, but this habit of delivering unfinished features and not bothering to resolve them on timely manner is gradually causing Google to be left in the dust for everything social-related.